Recently I discovered Evo Espresso on School Rd Yeronga. Set amongst a small set of shops including a naturopath, convenience store and a lovely boutique with homewares and gorgeous things for mummies to treat themselves. I had seen this coffee shop and ventured in. My first visit I nabbed a latte and one of their very tasty Mandarin and Macadamia cakes- to. die. for. Gluten free treats are incredibly moist – the cafe stocks mostly a range of cakes and some savoury items. But looking out the back door I found myself gazing at a fenced courtyard, complete with mini kitchen and a ride on for toddlers. Not to mention quite a few mummies present enjoying their caffeine hit. The next day I met a friend and her two little ones, taking my own toddler and new bub along. 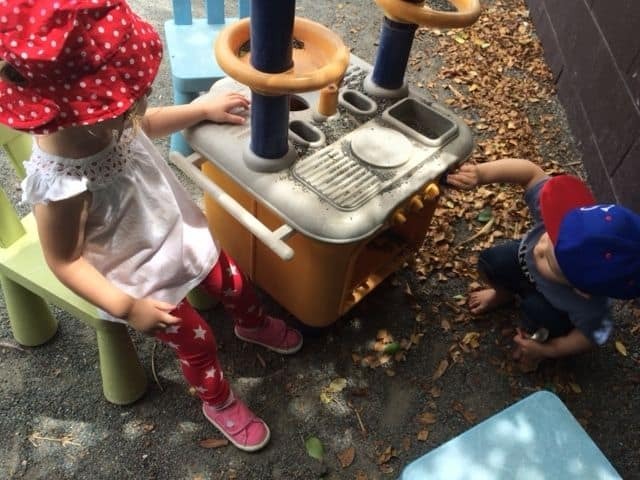 The toddlers played/explored quite happily while mummies caught up and had seriously good coffee and snacks. This time my toddler loved (and shared) her gingerbread man and my friend enjoyed the avo on toast. A short walk down School Rd also delivers a park, the Yeronga pool run by the BCC and a path leading to more adventures, playgrounds and sporting equipment. Evo is a toddler friendly cafe, that also provides a lovely fenced area to give you peace of mind: just wonderful in my book!